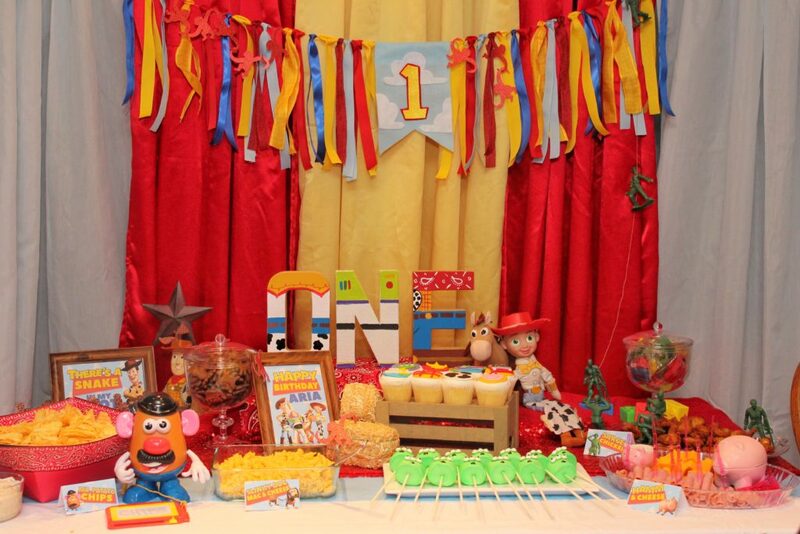 Hey howdy hey, we’re celebrating a first birthday! 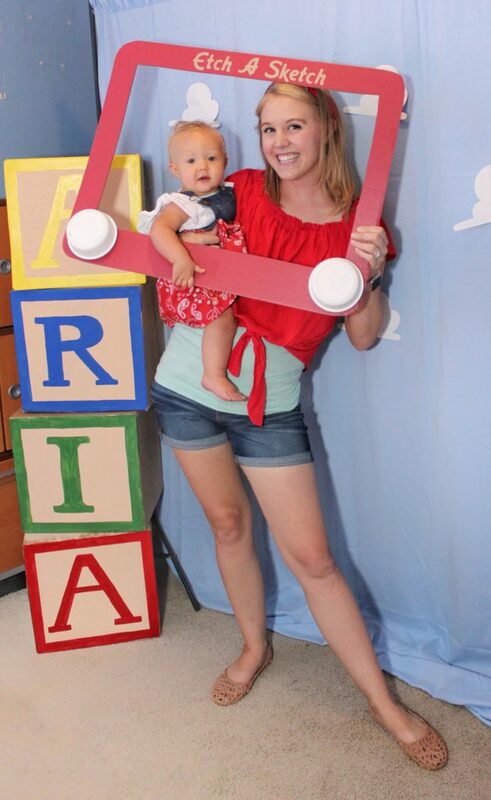 My daughter Aria turned one this year and we wanted to celebrate with a fun and unique theme. 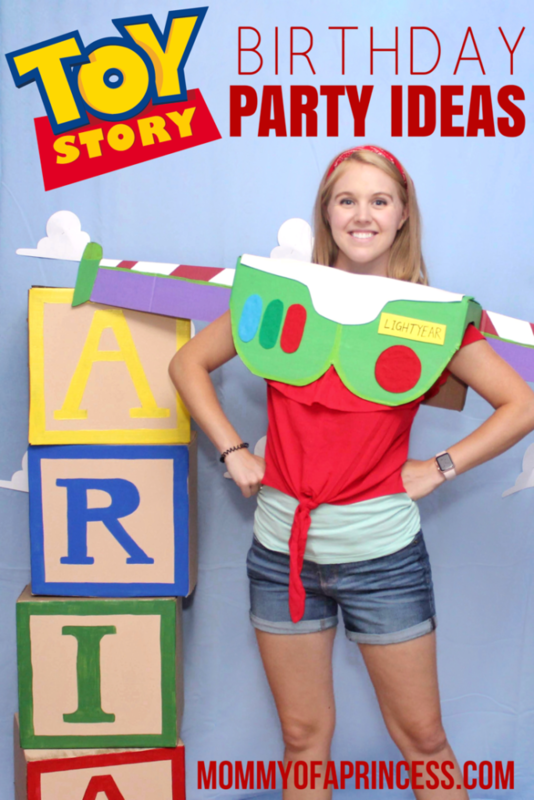 Toy Story has always been a family favorite and was the perfect way to commemorate her first birthday. 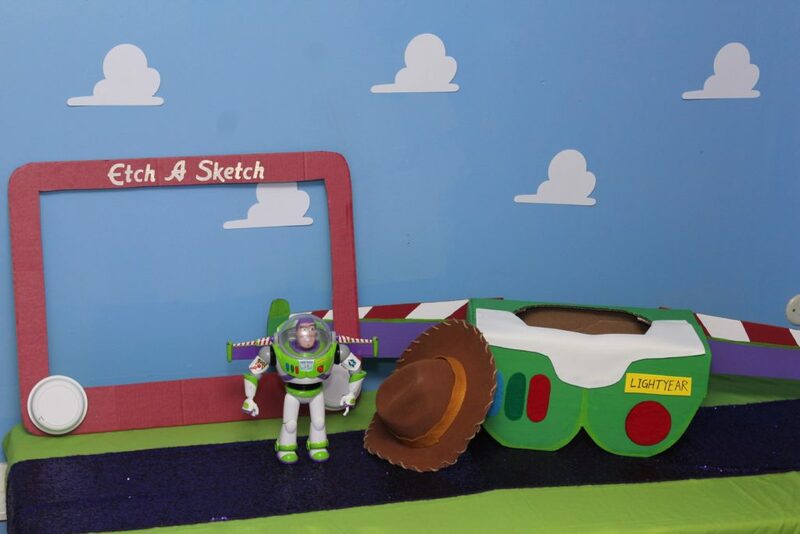 Here’s my Toy Story birthday party ideas and free printables. I used the primary colors of red, yellow and sky blue. 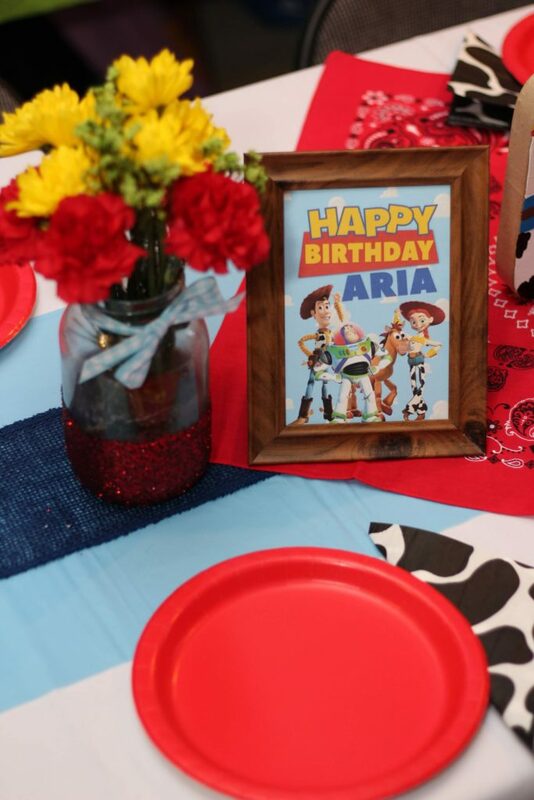 On the food table, I worked in lots of western touches, like these mini bales of hay, burlap and lots of bandana print fabric. I used Woody, Jesse and Bullseye dolls from when I was a kid. The red monkeys were cut from glitter paper on my Cricut. 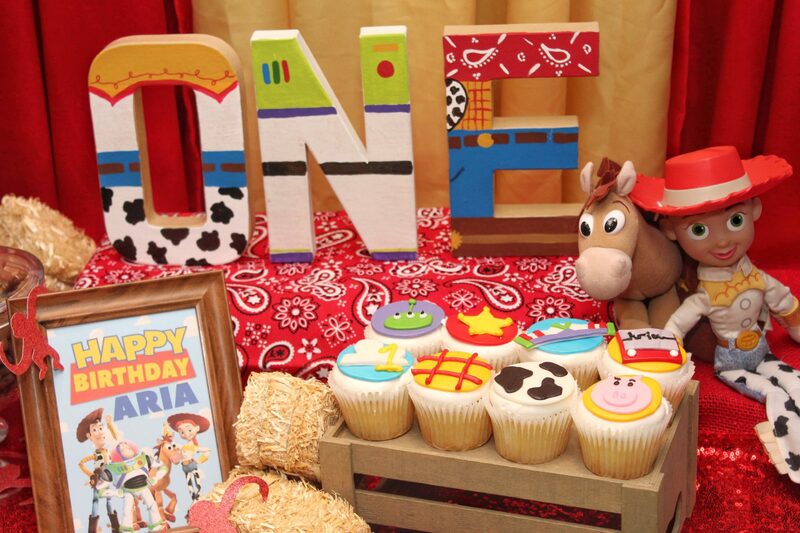 Lastly, the ‘ONE’ was painted from Paper Mache letters found at Hobby Lobby. I made the banner using a variety of different colored ribbon. The “1” was made from blue felt and a few layers of additional felt pieces. 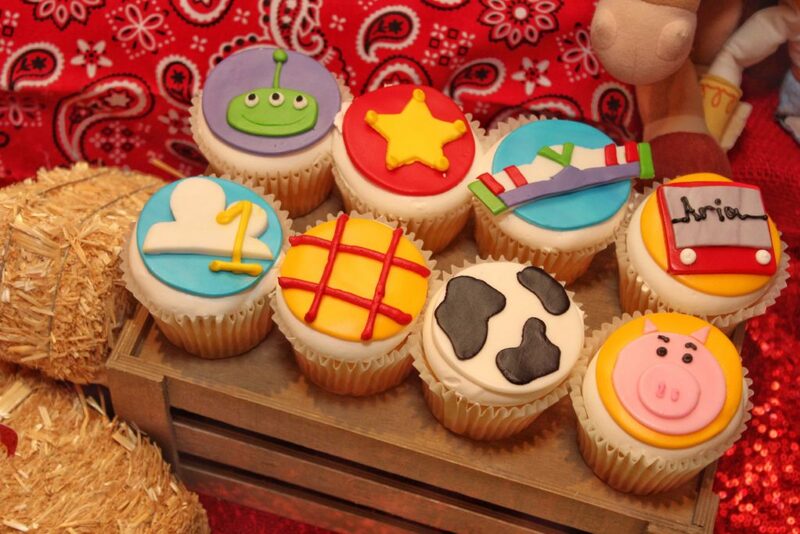 There are so many fun ways to incorporate Toy Story into party food. 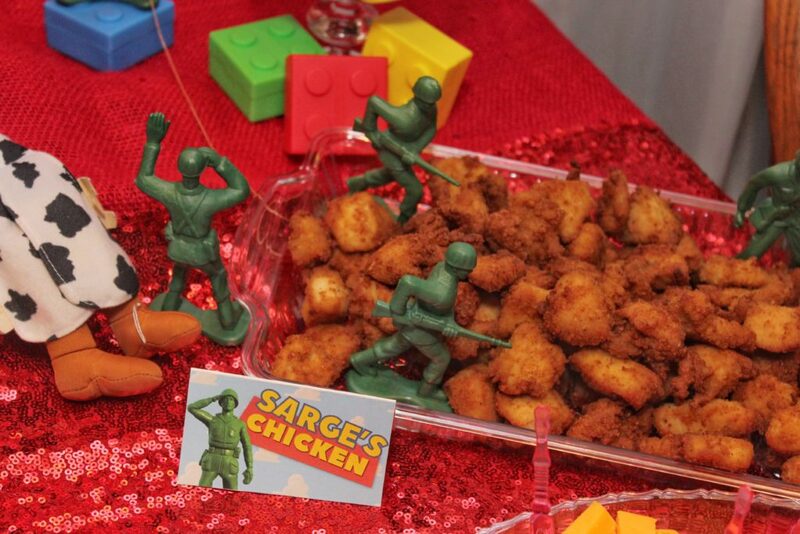 At our Toy Story First Birthday, we served Chick-fil-A chicken nuggets, named “Sarge’s Chicken Nuggets”. I positioned oversized army men from the Dollar Tree around the platter and repelling down the backdrop for some added character. 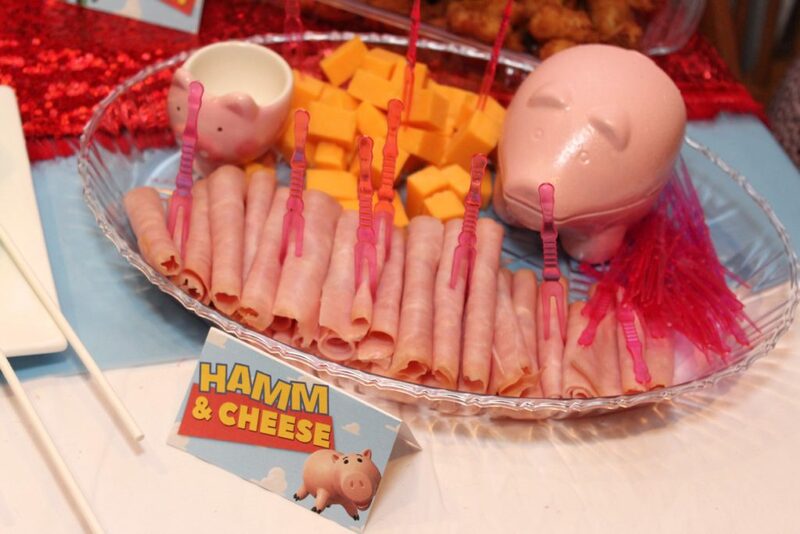 Also, we had Hamm’s Ham and Cheese platter, Slinky Dog’s Mac & Cheese (made with spiral pasta) and Mr. 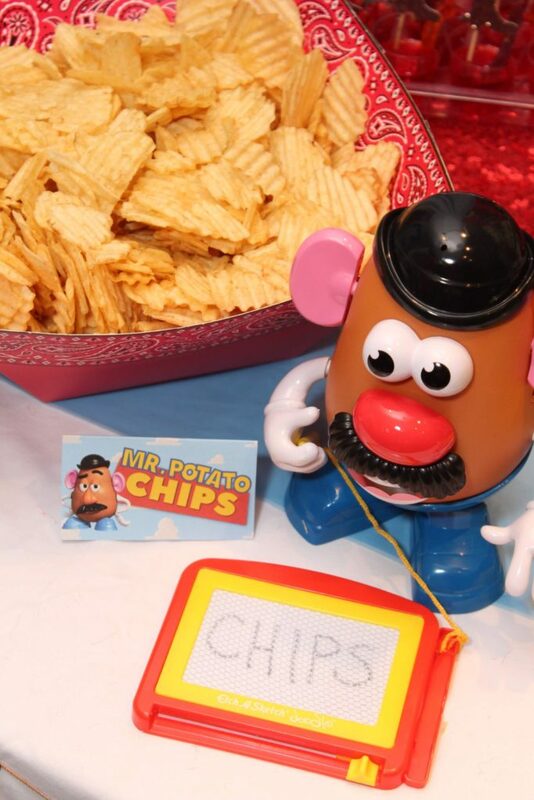 Potato Head’s Potato Chips & Dip. 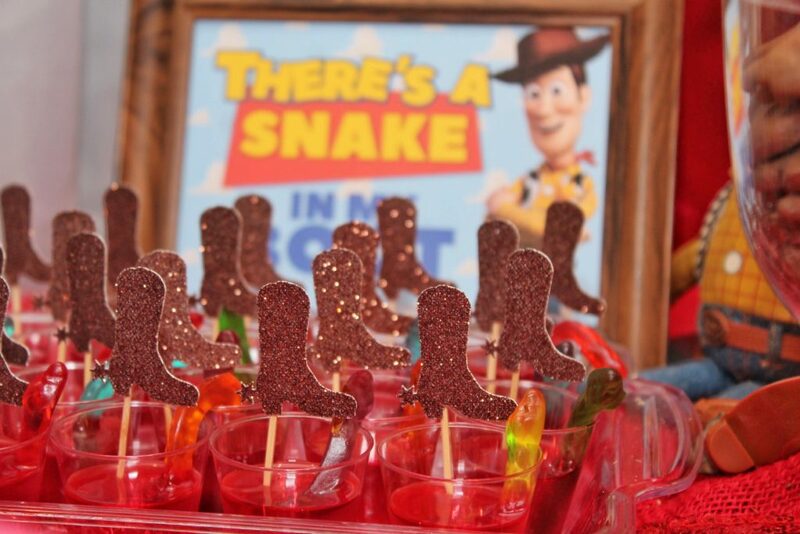 I created ‘There’s a Snake in My boot’ Jello cups with a gummy snake and glitter cut out boot. 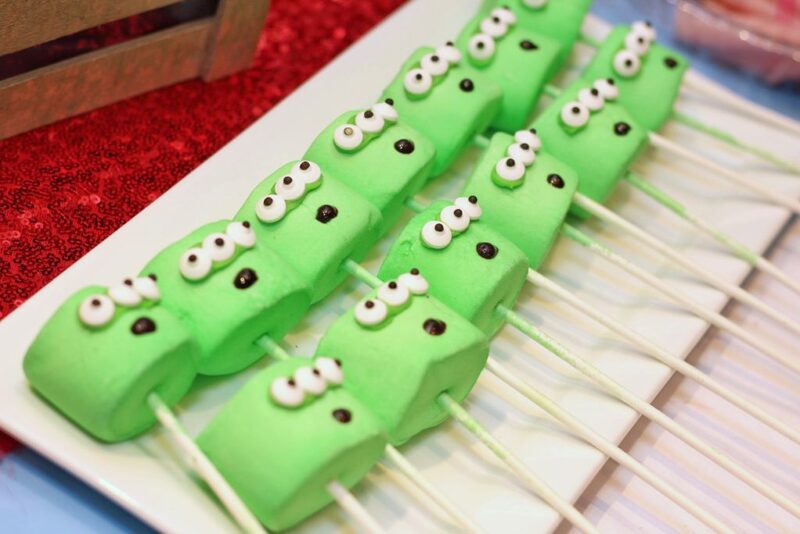 We also made Alien Marshmallow pops using a water spray bottle and food coloring. Once dry, we added the eyes with a little green frosting and the black mouths with glitter black gel icing. It’s always fun to present the drinks in a creative and themed way. 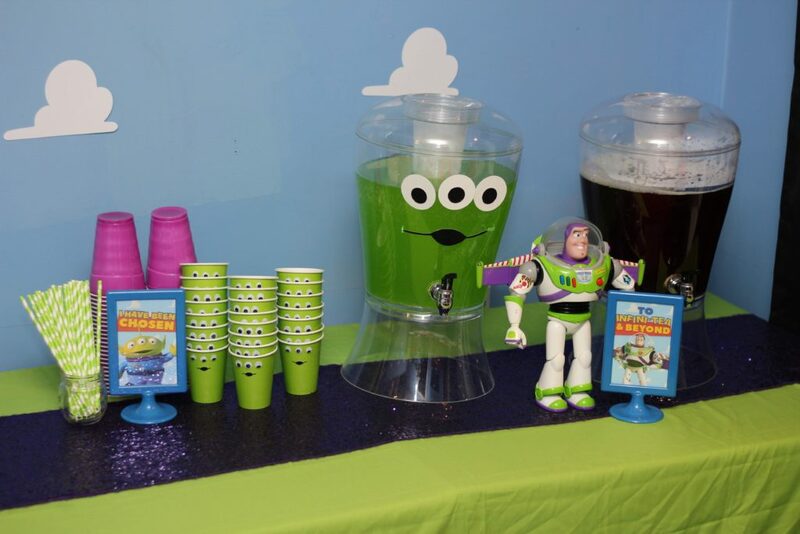 The drink station was Buzz Lightyear themed in green and purple. I made alien eyes for the Green Punch, made from Mountain Dew, Sprite and Green Hawaiian Punch. 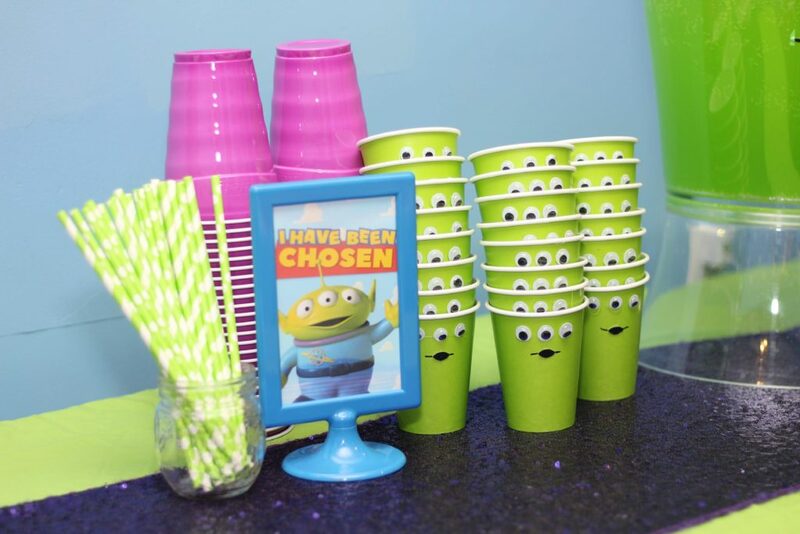 The Alien cups purchased from the Dollar Tree and I glued on googly eyes (also from Dollar Tree). 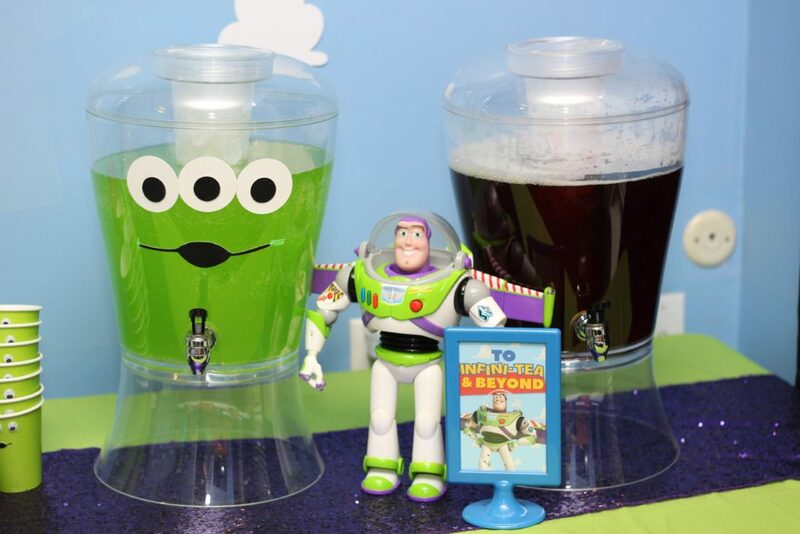 We also served Sweet Tea, titled “To Infini-TEA and Beyond”. 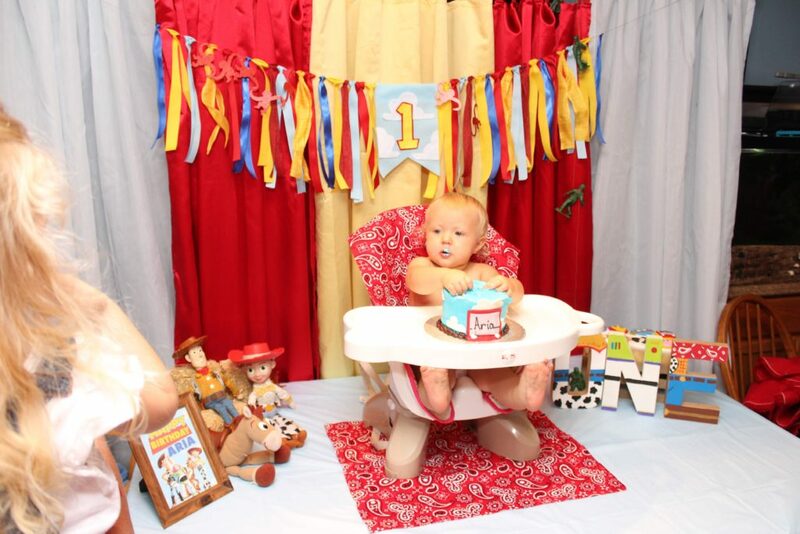 No party is complete without some fun photos. 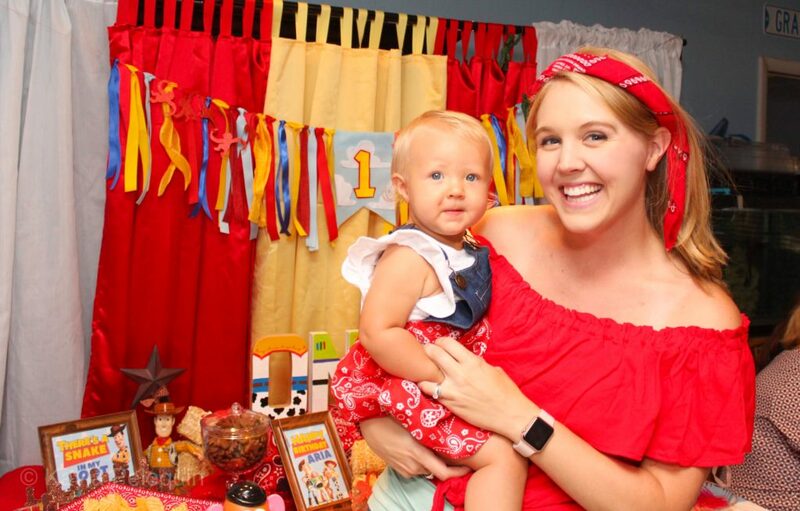 I created this backdrop with a queen size blue flat sheet and cloud cutouts pinned on. The block letters were made from $0.98 boxes from Walmart. I flipped them inside out before painting them and then free handed the letters. I made an Etch-e-Sketch out of a red piece of cardboard and two Tubberwear bowls spray painted white. The Woody hat was purchased from the Dollar Tree. I added twine woven around the edge and some felt around the crown. Lastly, the Buzz Lightyear piece was the most involved. This was made from a diaper box and painted by hand. It was so much for to try on. 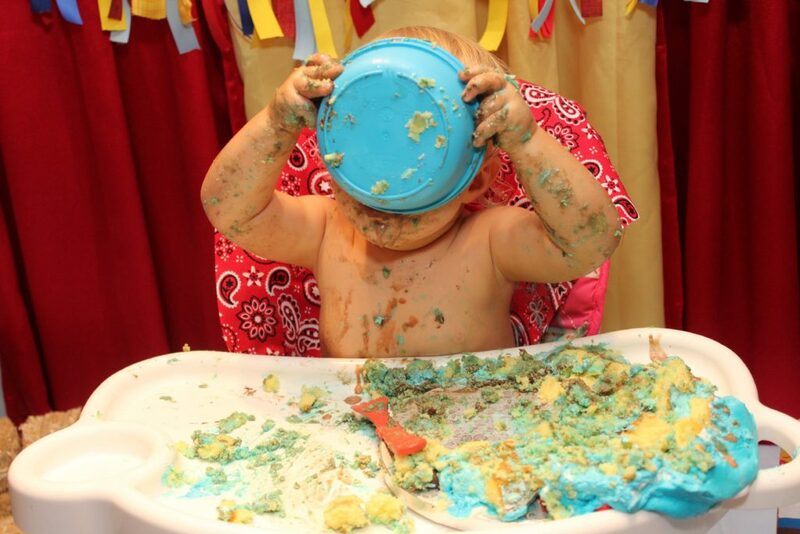 It’s not a first birthday without a cake smash. After all our guests finished eating, we converted the table and placed my daughter’s highchair right in the middle so everyone could see. 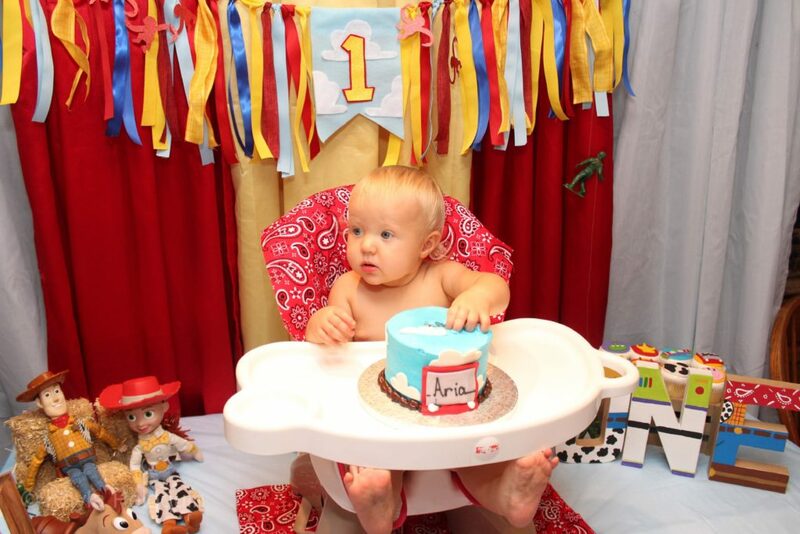 She loved her cake and it made for super cute pictures. Answer the questions and once approved, you’ll be granted access. Click on “files” to see all free printables for check out the pinned post. 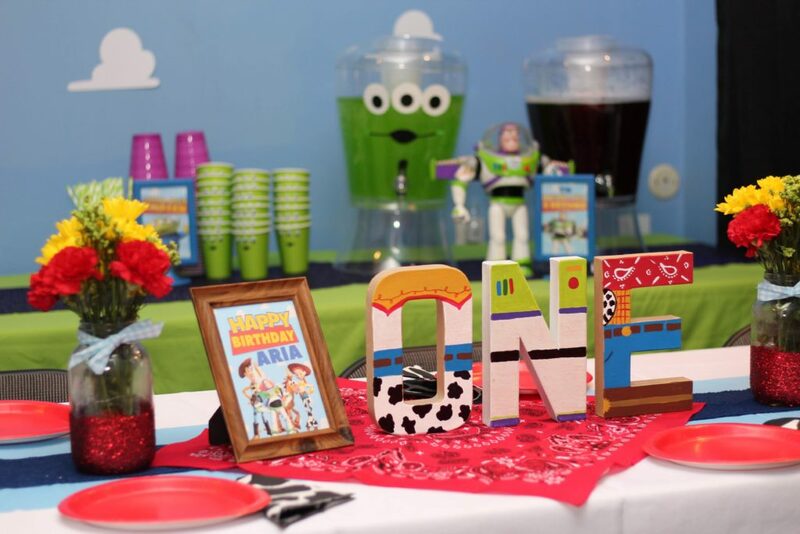 Hope your Toy Story party is out of this world! 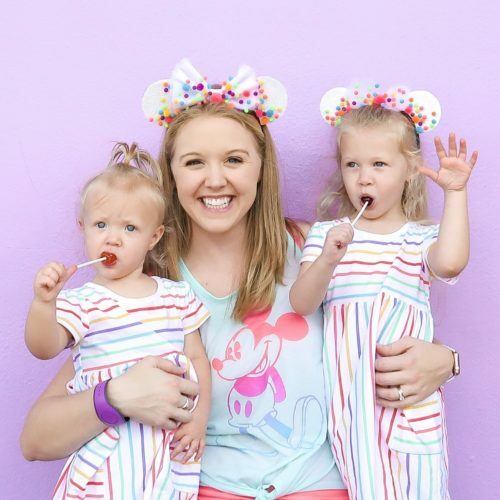 Have you visited Toy Story Land at Disney World? Check it out!